New! A nutrient dense trace mineral supplement specifically for all stages of lamb development—from starter to finisher. Contains high levels of calcium to properly balance the Ca:P ratio of high concentrate diets. Add Sheep/Goat Vitamin A/D/E Premix for diets low in fresh forage. 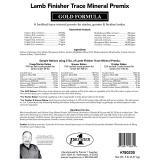 Formulated by Premier’s small ruminant nutritionist, Dr. Dan Morrical, Ph.D., Lamb Finisher Trace Mineral Premix maximizes your flock’s health and immunity. Contains high levels of zinc, iodine and other essential trace minerals. Calcium has been increased to properly balance the Ca:P ratio of high concentrate diets. Ingredients: Calcium Carbonate, Zinc Sulfate, Manganese Sulfate, Sodium Molybdate, Mineral Oil, Ethylenediamine Dihydriodide, Sodium Selenite, Ferrous Sulfate, Cobalt Sulfate. Limestone is used as a carrier for calcium. 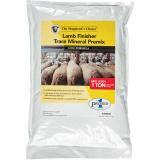 Mix 5 lbs of premix with 1 ton of lamb feed. 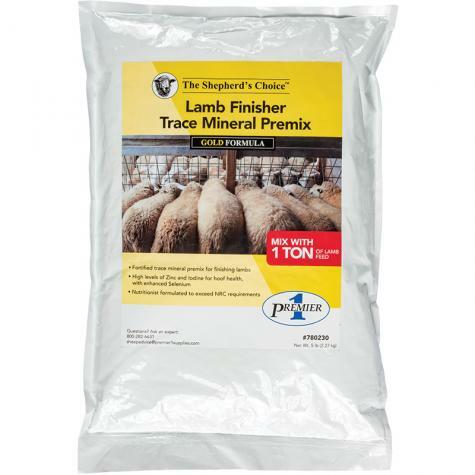 Thoroughly mix Lamb Finisher Trace Mineral Premix, Sheep/Goat Vitamin A/D/E Premix, Ammonium Chloride and Deccox with 20–30 lbs of cracked corn. Then add to the remaining ton of lamb feed. Always provide a source of fresh, clean water. Download sample rations (see Instructions/Diagrams above). Sample rations also shown on back label. Questions? Ask a sheep expert to help customize a mineral ration for your situation. Including more than 5 lbs of this trace mineral premix per ton of feed will exceed the allowable FDA intake levels of .69 mg of selenium per head per day. Read all warnings and cautions on label. Follow mixing and feeding instructions carefully. For livestock use only. A feed additive used to increase the calcium content of livestock rations. A vitamin premix for livestock. Contains Vitamin A, D, E, and Calcium. Added to sheep and goat rations to maximize flock health and immunity. Add to sheep and goat rations to treat and prevent urinary calculi in male animals. Can be used as an oral treatment. Use to control coccidiosis in ruminating calves, cattle, sheep and young goats. Portable 3 ft feeder used to provide grain, minerals, salt or water to animals. Stackable for easy movement and storage. Portable 5 ft feeder withstands all weather and animal conditions. Stackable for easy movement and storage. I have been looking for a product to use that met the recommendations of Dr. Morrical after watching the video of his presentation at Premeir 1 sheep field day. I ordered this product and the sheep mineral as soon as I was aware that they were available. This fills the void I had with other premixes.